Monday was a day marked by landmark catches at both of my program sites. At Blacks Creek one of the campers was surprised to pull up a net full of sea weed and find what he believed to be an American eel, a species that our Blacks Creek Explorers have become very familiar with. When he brought the contents over to me to help him remove the slender creature, I was thrilled to see that, instead of the an eel it was a common pipefish. This was the first time that the kids or myself had encountered one of these interesting cousins to seahorses at Blacks Creek. The kids, as usual, were thrilled to have found something new and were interested to hear about the mating habits of the species. 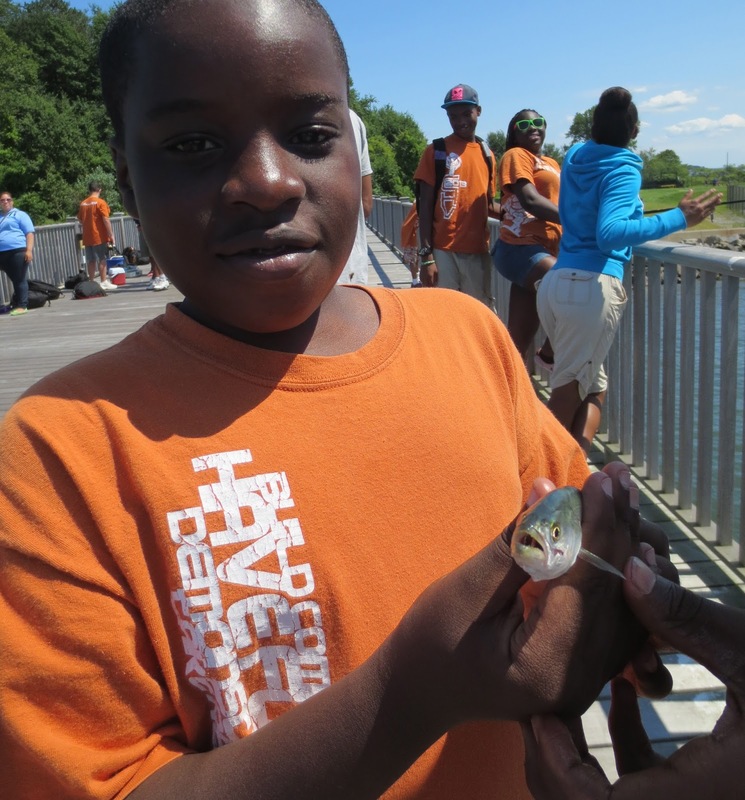 Our luck at Blacks Creek carried over to fishing club at Camp Harbor View. The bluefish that are beginning to show up in Boston Harbor graced our rods with a few nibbles and one of the campers was lucky enough to hook up. While it was just a small one, the camper who caught it was still proud of his first fish. Hopefully we can get some bigger ones to bite before the summer closes out. A fisherman with his catch. Close up of a toothy maw. Additionally, the small minnow trap that we have hanging off of the side of CHV's dock managed to capture the smallest flounder that I have ever seen. While both of our catches during club-time were diminutive in size, they both served to excite the kids in the club for the prospect of catching more fish and for the upcoming fishing trip that we will be taking with them.